Disclosure: This post is brought to you in partnership with Monterey Mushrooms. As always, I only work with those companies I firmly believe in and keep on hand in the Shaw Kitchen! Thanks for supporting the brands that keep Shaw’s Simple Swaps alive. Truthfully, my love for burritos began when I was in college. We used to frequent the local Roberto’s for a delicious breakfast burrito after a long night of studying! Alright, well maybe there were other reasons we went straight for the burritos, but nonetheless, they were totally satisfying. Well, that was until about an hour later, when I felt like my insides were going to pop! Maybe it was the extra love (aka grease) they put into the mix, I’m not quite sure. But, ever since then I’ve been determined to #simpleswap them into a friendlier version that I can enjoy without the food coma! Enter, these NEW California Breakfast Burritos! The secret to the powerful flavor in these beauties: Monterey Mushroom’s latest Let’s Blend line of chopped seasoned mushrooms! Seriously, this new supermarket find is the easiest way to add more flavor, nutrition and power to your everyday staples. Rather than spending your precious time laboring over dicing up the shrooms, Let’s Blend does it for you! And, with three varieties (Classic, Italian and Mexican) you can rest easy knowing they’ll blend perfectly into your burgers, meatloaf or chili based on your desired flavor preference. Now, here’s the deal with these burritos. 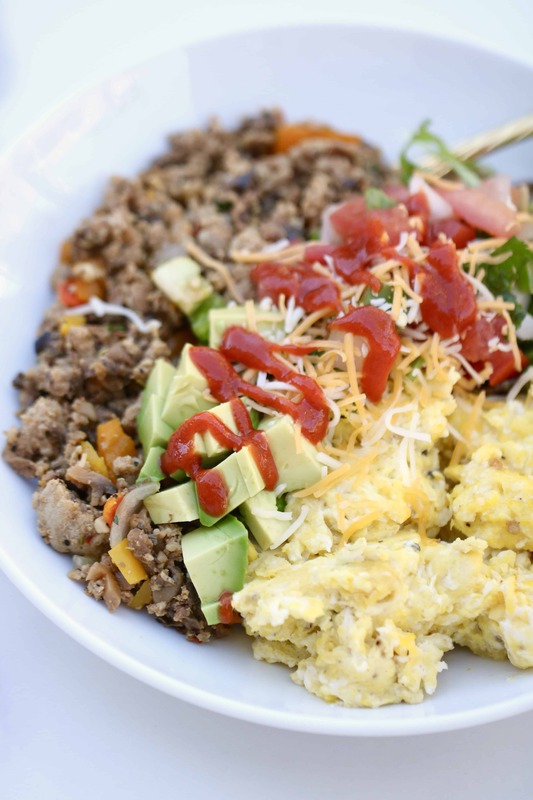 Or, if you are trying to go a little more “bowl” style, you can easily leave off the tortilla and make an open faced burrito bowl just like the fancy restaurants do! See, the possibilities are endless when you add a Let’s Blend Monterey Mushroom to your grocery cart. Check out Monterey Mushroom’s website for more amazing recipes and be sure to keep an eye out in the refrigerated produce section of your local market to stock up on Let’s Blend! A California treat you can enjoy morning noon and night! These breakfast burritos are loaded with flavor and all the goodies! Heat olive oil in a large nonstick skillet over medium high heat. Add in the onion and bell pepper, cooking until slightly tender, or about 3 to 5 minutes. Add in the ground turkey, garlic powder and black pepper, string to combine. 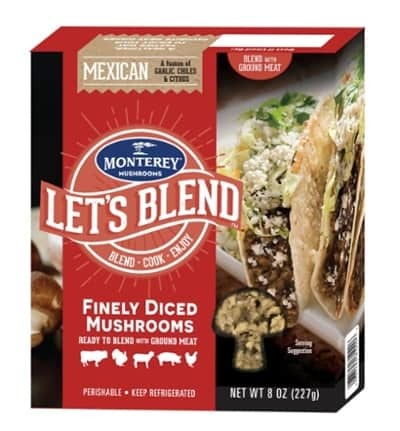 When half the meat is browned, mix in the Let’s Blend™ Mexican Finely Diced Mushrooms. Continue to cook until meat is fully browned, or internal temperature of the mixture is 165 degrees F.
Remove from heat and place into a glass Tupperware container, set aside. Using the same pan, spray with cooking spray and add in the whisked large eggs. Cook until done. Warm tortillas over the stovetop. 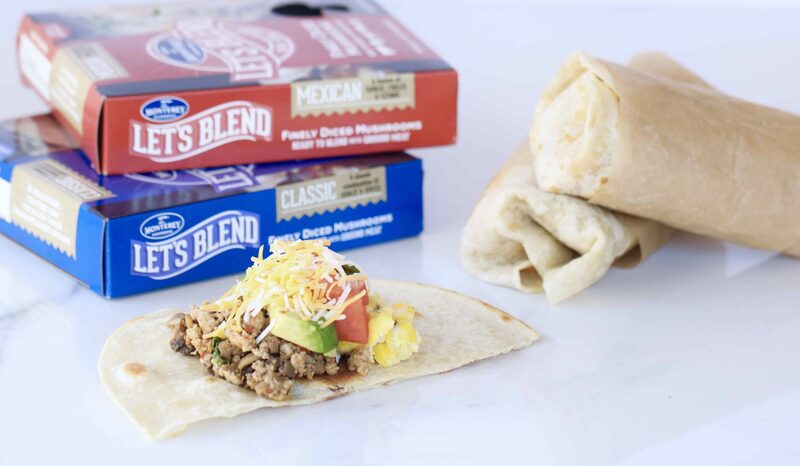 Portion 1/4 cup eggs and 1/3 cup of Let’s Blend™ ground turkey mixture in the center of the tortilla. 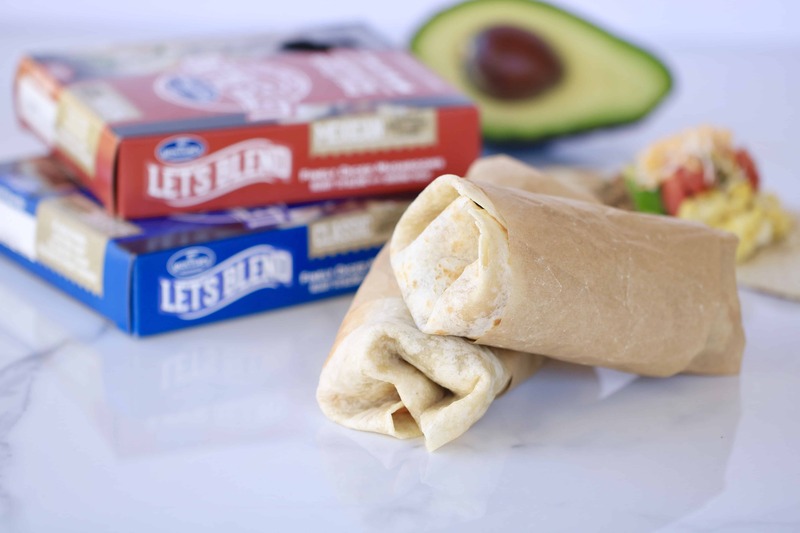 Top each burrito with even portions of chopped avocado, fresh salsa and shredded cheese. Roll into burritos by folding one end of the tortilla to meet the other, gently pushing back the tortilla and ingredients so that they are tight. Fold outside edges inward, then roll until burrito is closed. Repeat until desired number of burritos is formed. Burritos can be stored in the refrigerator for up to 5 days and frozen for up to 4 months. *Gluten free tortillas can be used to create a gluten free option. Or, omit the tortilla and enjoy the blended mixture over a bed of spinach. *If freezing, suggest to omit the avocado and salsa from preparation. I love how versatile this burrito is! I could easily see tossing in some leftover veggies or roasted potatoes, too. And I love mushrooms! Will need to look for those. Totally! You can really modify this based on what’s in your fridge! What a healthy breakfast option! These look really filling and delicious. Thanks Kelly! They are very satiating! YAS! So glad I’m in such good company! Thanks Whitney! And totally customizable to be plant based too! I love a breakfast burrito! And pre-diced veggies are the best for saving time! Totally!! The best simple swap out there! Love that the mushrooms come pre-seasoned and chopped. Sounds so easy for busy days! Wake me up for these!!! I love adding mushrooms to recipes like this. Yummm. You betcha!! I would gladly make these for you and the fam any day! I cannot wait to get my hands on some of these Lets Blend mushrooms! I’ve been adding shrooms to so many things, like taco meat, but I feel like the possibilities are limitless now! 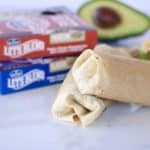 Cannot wait to make these tasty burritos for my men! Oh goodness, with all your eggs, you’ll be able to have plenty for freezer meals too! 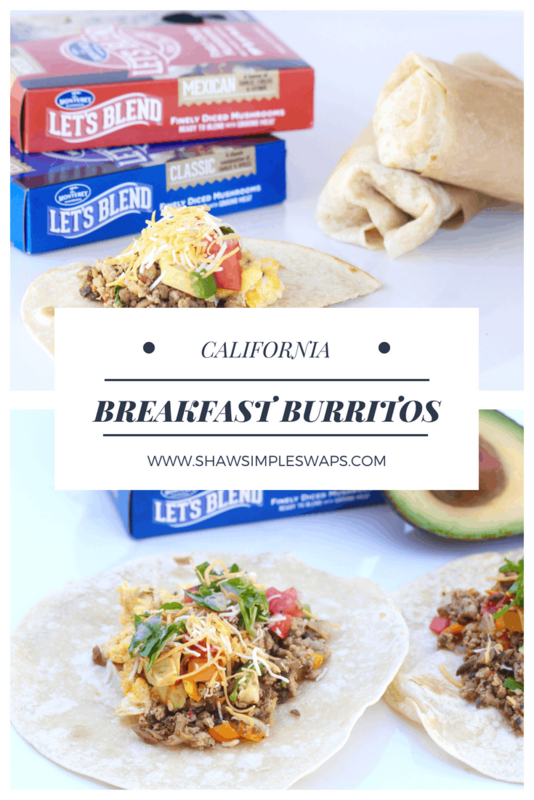 These California breakfast burritos are a delicious way to start the day! Love these for a breakfast meal prep for the week! Totally, the best way to plan ahead!